Registration and Account Information: In order to access and use certain content, features and functionality of the Services, whether as a User, or a Subscriber, we require that you create an account and provide and/or make available (e.g., via third party services) to us certain information such as your email address and your name. In addition to these three mandatory fields, we request access to your calendar to help you countdown to events in your calendar, and access to your location to show holidays, events, and other content within your vicinity. We also request access to your Device photos and folders to attach photos to your countdowns and to locally store modified images and log data. If you do not use your email to register, you may register to use our services via Facebook. The Information we collect from these thirds parties during registration includes your profile picture, age range, and gender in order to generate your user profile. In addition to these required information, we ask for secondary information in order to personalize your experience. These optional fields are date of birth, gender, photos and contacts. We collect only the Personal Information necessary to provide the Services and to provide you with a more customized and relevant experience. 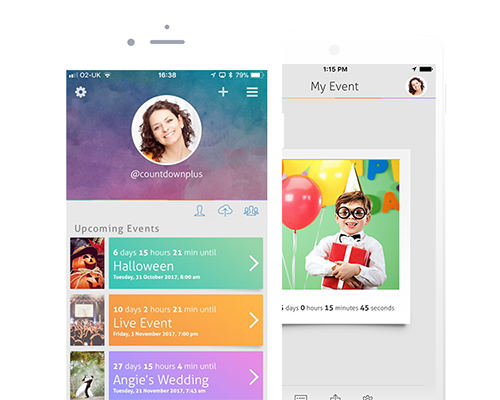 Once you provide us with this information mentioned above, we offer you our additional Services such as using your Facebook photos to customize your events, liking or tracking your friends and their events, etc. Location Information: In order to provide you with your country holiday calendar and information about events in your area, we ask your permission to collect location-based information from you or your Device, including your IP address, city, country, zip code, region, radius, time zone, GPS-based location information, and longitude/latitude. Your location is used to personalize the content you see within the Services. We may also collect other information based on your location and your Device’s proximity to “beacons” and other similar proximity systems, including, for example, the strength of the signal between the “beacon” and your Device and the duration that your Device is near the “beacon”. The type of location data we collect depends on a number of factors, including the type of Device you are using (e.g., laptop, smartphone, tablet) and the type of connection enabled on your Device (e.g., WiFi, Bluetooth, broadband cable). If you agree to allow access to your location, you agree that we and our service providers may collect such location-based information from your Device. We may use and share that location-based information with third parties to deliver, market and promote the content, services, features, products and advertising (and/or to verify your rights to receive such content, services, features and/or products) that are available through the Services. If you no longer wish to have this location information collected and used by us, you may “opt-out” by disabling the location and Bluetooth features in the operating system of your Device and/or in the Countdown+ App. Third Party Platform Information: If you access the Services via your Third Party Platform account (e.g., by logging in to the Services using your Third Party Platform account credentials from third parties like Apple (iTunes, etc. ), Facebook, Twitter, and Google) and/or integrate your Countdown+ account with your Third Party Platform account, we may collect certain information about you from the Third Party Platform, such as your username, email address, events and other information you provided to the Third Party Platform in connection with your account (name, country, date of birth, friend connections, user posts, profile picture, Device ID, gender and e-mail address). If you do not connect Countdown+ to a Third Party Platform, or otherwise disconnect your Countdown+ account from such Third Party Platform, that may limit our collection of certain Information about you, which may limit your ability to use certain features of the Services. Personal Information You Choose to Provide to Obtain Additional Services: We may collect Personal Information that you choose to provide to us when you elect to participate in optional Site-features or Services. For example, if you sign up to receive newsletters, marketing promotions or other communications regarding the Services, and/or third-party products or services, participate in contests, surveys and other promotions related to the Services, we may collect your name, email address, mailing address, phone number and survey responses in order to provide the additional features or Services. We will make clear what information we may process as a result of your engagement with the optional Site-features or Services. To provide you with an estimate for the cost of our products and services. To determine which features and functionality of the Services users like best to help us operate the Services, enhance and improve the Services. To enable you to connect with others who use our Services (e.g.your friends on Countdown + with whom you want to share your activities on Countdown +). Our Group Entities: We may disclose your Information to other group entities that are affiliates and/or subsidiaries or parents of Countdown+ and Apps Beyond in order to provide you with tailored products, services and communications or in accordance with our internal policies or administrative or business practices. Your Friends: We may disclose your Personal Information with your friends on Countdown+ if you tell us you want to share such information and your activities on Countdown+, all in accordance with the preferences you set in your account. With Your Consent: We will obtain consent from you prior to enabling your use of any location-based services. If you reside in the EU, we will obtain consent from you prior to sharing your Personal Information with third parties for their marketing purposes if we are unable to rely on our legitimate interests in doing so. Corporate Transactions or Events: We may disclose your Information in connection with, or during negotiations of, any merger, sale of company assets, financing or acquisition, or in any other situation where Information may be disclosed or transferred as one of our business assets. To Fulfill Your Requests: If you elect to use certain authentication or sharing features available on the Sites or via the Services, we may use your Personal Information to fulfill your request to share content with or provide access to such third parties (e.g. Facebook, Instagram, or Twitter). At times, you may be presented with the option to “opt-in” to receiving certain push notifications, marketing and promotional communications or other information from us and others that we think will be of interest to you. Recipients of such communications can unsubscribe or “opt-out” by following the specific instructions included in such communications or by adjusting your Countdown+ App settings in your Device. At any time you may request that we delete your Information and/or your account, or opt you out of receiving marketing and promotional e-mails from us, by emailing us at [email protected] detailing your request. Please note that such requests may not take effect immediately, but will be processed without undue delay and during which time your Information shall remain subject to the prior privacy settings. We will take steps to delete your Information as soon as is practicable, but some Information may remain in archived/ backup copies pursuant to our legal obligations or as otherwise required by law. We will communicate the erasure to each recipient to whom Information was disclosed, unless this proves impossible or involves disproportionate efforts. The Countdown+ App and the operating system settings in your Device will also present you with the option to disable certain features which allow it to collect and use certain Information from your Device, including location-based information. If you do not wish to have location-based information collected and used by our service providers and us, you may opt out by disabling the location features on your Device. Please note that if you disable such features, you will not be able to access or receive some or all of the services, content, features and/or products made available via the Countdown+ App. Stop receiving our marketing communications. If you opt out of marketing emails you will continue to receive messages from us about your relationship with us where permitted by law. If you wish to exercise any of these rights please contact us at [email protected] Please note that some requests may require you to verify your identity. Our Sites and Services are not directed to children under the age of 16. We do not knowingly collect Information from children under the age of 16. If you are under the age of 16, you may not use the Services, including registering for or providing any information about yourself to or in connection with the Services, participating in any sweepstakes, contests, social networking features, posting, communications functionality or engaging in other activities that collect and/or permit you to enter information about yourself. If we obtain actual knowledge that we have collected Personal Information from someone under the age of 16, we will promptly delete it, unless we are legally obligated to retain such data. If you believe that we have mistakenly or unintentionally collected information from someone under the age of 16, please contact us at [email protected] For users in the United States, please also visit http://www.ftc.gov/bcp/edu/pubs/consumer/tech/tec08.shtm for information from the Federal Trade Commission about protecting children’s privacy online. Our operations are supported by a network of computers, cloud-based servers, and other infrastructure and information technology, including, but not limited to, third-party service providers. We and some of our subsidiaries and affiliates, servers, vendors and service providers may not be located in your jurisdiction and may also be located outside of the European Economic Area (“EEA”) and Switzerland. If you download, interact with and/or otherwise use the Services from a location outside the U.S., please be advised that any Information you provide, or that is collected by us from Third Party Platforms, in connection with any such activity may be processed in and/or transferred to the United States and/or other territories and locations, where privacy protections may not be as comprehensive as those in the territory or location where you download, interact with or otherwise use the Services. If you are an EU citizen or resident in the EU, we will transfer your Personal Information to the United States in accordance with EU data protection law requirements by using model contractual clauses that have been approved by the European Commission or other appropriate means. If you are a resident of the State of California, we provide you with information on how to exercise your disclosure choice options such as your right to opt-out (which we may sometimes refer to as “unsubscribe”) with respect to use of your Personal Information by third parties for marketing purposes. Therefore, pursuant to the California Civil Code, we are not required to maintain or disclose a list of the third parties that received your Personal Information for marketing purposes during the preceding year. If you are a California resident and wish to request information about how to exercise your third party disclosure choices, please send a request by email to our Privacy Administrator at [email protected] All requests must be labeled “Your California Privacy Rights” on the email subject line. For all requests, please clearly state that the request is related to “Your California Privacy Rights”, include your name, street address, city, state, zip code and e-mail address (your street address is optional if you wish to receive a response to your request via email) and indicate your preference on how our response to your request should be sent (email or postal mail). We will not accept requests via the telephone, postal mail or by fax. We are not responsible for notices that are not labeled or sent properly, or do not have complete information. For clarity, only DMCA notices should be sent to the Designated Agent and any other feedback, comments, requests for technical support, and other communications should be directed to Countdown+ customer service by sending an email to [email protected] You acknowledge and agree that if you fail to comply with all of the requirements of this Section 15, your DMCA notice may not be valid.